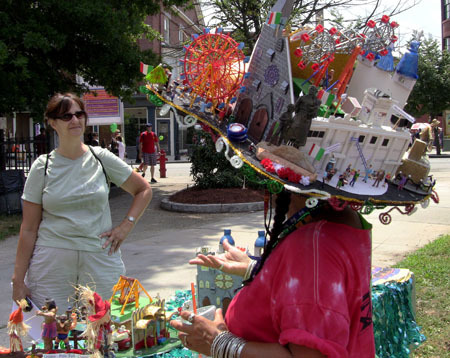 We had great fun at this year’s Lowell Folk Festival, where artisans demonstrated the folk art of head and foot gear. Who knew there were so many ways to adorn the head and protect the feet? 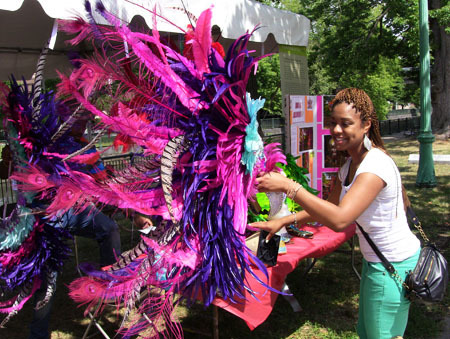 Luidgi Felix and Nicole Scott from the Trinidad and Tobago Social Club brought several Caribbean Carnival headdresses to show. 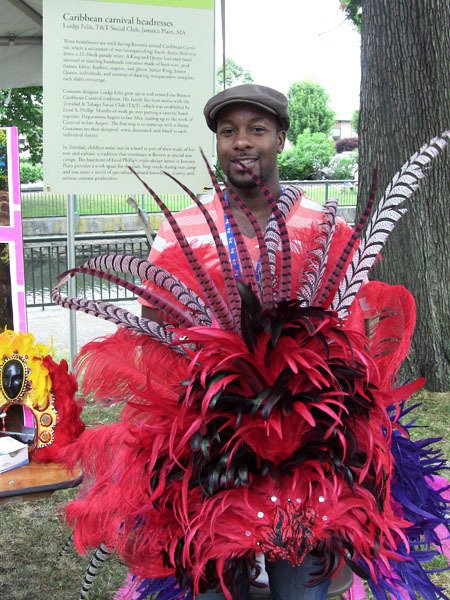 These handmade costumes are worn by dancers in Boston’s annual Caribbean Carnival. Here Nicole Scott shows off one of their creations. Months of work go into constructing these costumes made of wire, steel, feathers, sequins, and glitter. 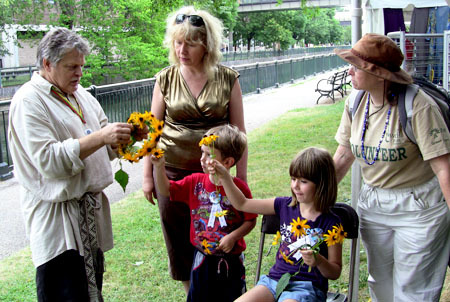 Jonas Stundzia brought the tradition of Lithuanian Midsummer celebration to Lowell. Under a huge double-horsehead gate, to the sound of Lithuanian folk songs, he created head garlands out of oak leaves and wild flowers. Visitors joined in, making garlands for themselves. 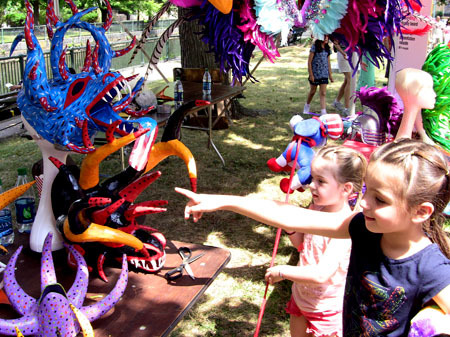 Angel Sánchez Ortiz brought his Puerto Rican vejigante masks used for carnival celebrations. His striking, fantastical masks of boldly painted papier mâché depict animals, legendary people, and sometimes spirits and monsters that are imbued with cultural meaning. 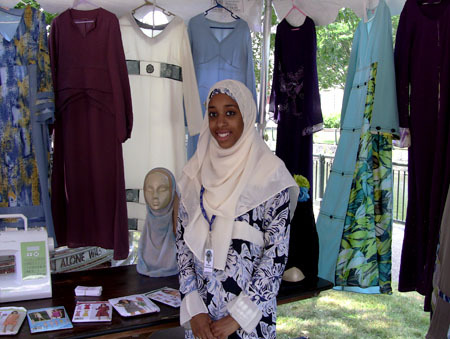 Qamaria Amatul-Wudud designs and sews fashionable clothing for Islamic women who choose to dress modestly. She brought some of her elegant dresses and showed visitors how to wrap headscarves. Eniko Farkas brought her Hungarian beaded maiden crowns worn by unmarried girls after confirmation. Before marriage, they would ritually replace them with a married woman’s headdress. 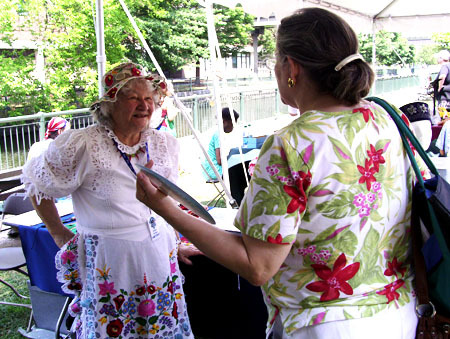 Eniko also talked with visitors about the traditional Hungarian art of embroidery. Our own J. Arthur Poitras from Lowell seemed to have brought his entire cobbler’s shop with him. There were pliers, knives, creams, and even a hanging shoe last. 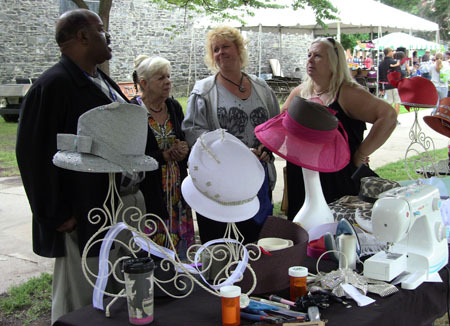 The infamous “Hat Ladies” of Gloucester, Amy and Robyn Clayton amazed people with their whimsical hats. Here, Amy hands out pamphlets about the Saint Peter’s Fiesta next to their handmade statue of Saint Peter. 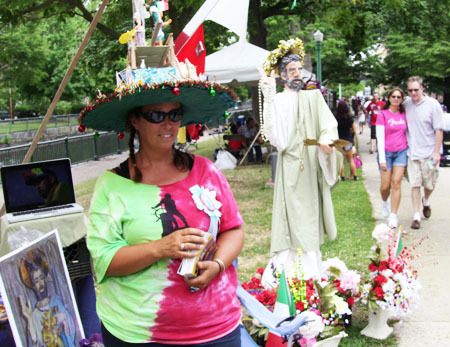 The “Hat Ladies” make a new hat every year for the Saint Peter’s Fiesta, featuring local sights in miniature. 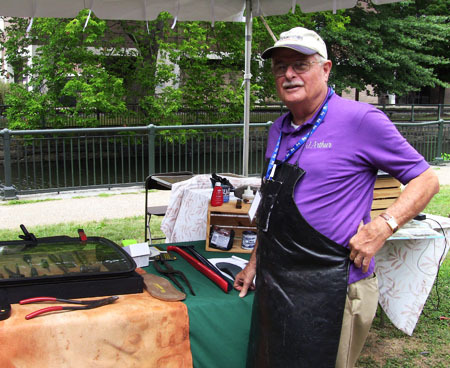 For the Lowell Folk Festival, they even brought a life-size cut out of Saint Peter for visitors to pose with. 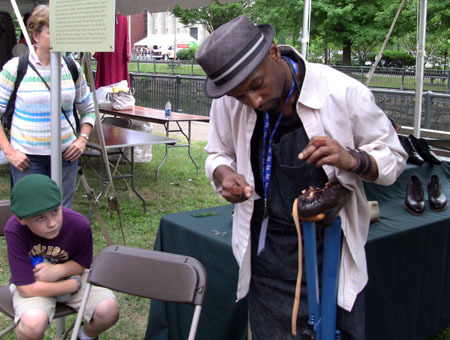 Theodore Green entranced visitors as he constructed hand built shoes out of leather. If you looked down, you may have noticed his own glittering gold shoes! Samuel Brown and his custom made hats were a big hit. It was all he could do to keep the ladies from walking off with his hats on their heads. 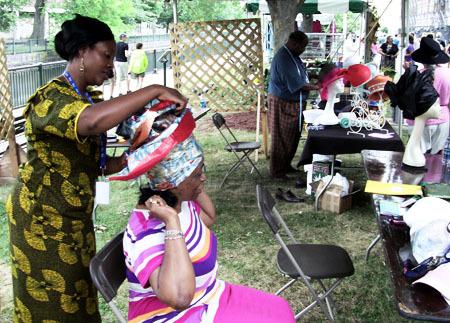 Faith Izevbijie demonstrated how to tie gele, Nigerian headwraps. And, last but not least, there were tomatoes, lots of tomatoes. Eleni Zohdi was one of five cooks demonstrating recipes using tomatoes. 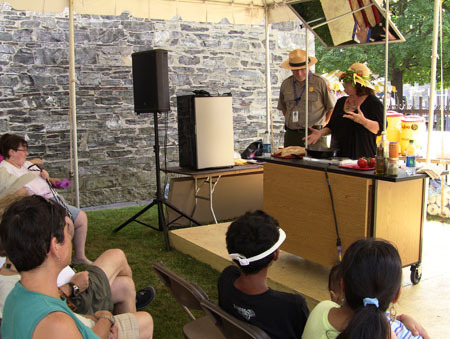 Here she explains how to make a Greek dish called Kayiana, with Lowell NHP Chief of Cultural Resoruces David Blackburn looking on. We all had a good time and hope you did too. If you missed it, there’s always next year!